system, in his new book "Extreme muscle makeover" written by international speaker, author and professional entertainer Batista Gremaud. 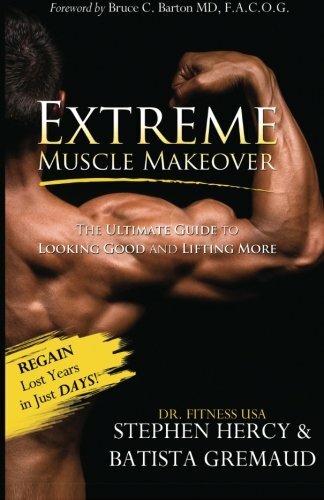 Extreme muscle makeover is a must read for anyone interested in maximizing time and results with their approach to exercise. Stephen Hercyâ€™s deep interest in the works of Carl Jung led him to conclude that women should not workout like men and vise versa. From these notions, he developed his unique Body Design Formula System, which stems from his 45 years of practical experience, research and case studies. The book describes step-by-step the philosophy and findings behind the Body Design Formula System, enabling anyone whether a celebrity, housewife, professional or student to tune into the natural biorhythms of the body and avoid the pitfalls of the exercise world, reduce pain as in fibromyalgia for example, prevent injuries and achieve maximum results for sustainable long term health in a beautiful, mystical and magical way. In its 11 chapters readers learn: â€¢ Why women should not train like men â€¢ The influence male and female energies have while exercising â€¢ The connection between strength training and the proper functioning of the nervous system â€¢ The importance of proper ergonomics and environment â€¢ The significance of proper postural alignment â€¢ The reasons why most fitness systems fail long-term â€¢ The facts about yoga and aerobic activities â€¢ The truth about working-out with personal trainers â€¢ The myths around programs focusing on weight loss or weight gain â€¢ The reality beyond injuries prevention and rehabilitation Hercyâ€™s methods donâ€™t involve screaming, pushing, controlling, manipulating, or forcing anyone to go beyond their limits. In fact his experience proves that the best way to achieve maximum fitness results long term is never to do anything that is uncomfortable. The Body Design Formula is the fastest way of grounding oneself spiritually by strengthening the nervous system, to handle inward and outward stress. It is more than an exercise program, it is a holistic approach to transforming oneâ€™s life through bodybuilding.